How are You Shining Your Light? 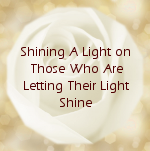 Or Do you know someone who is Shining Their Light? Let us know! Orgena Rose hosts a successful, weekly TV show that inspires, transforms and empowers you to love yourself and live your highest and best life with segments highlighting leaders and experts in the arts, mind, body and spirit. Think Oprah meets Ellen meets SNL with comedic and dramatic skits, live music, and insightful and provocative interviews with those who challenge conventional ways of thinking and believing with real, practical and proven solutions to share. Watch each week as the heart-centered leader, Orgena Rose, combines her years of experience being on the major TV Networks, Talk Shows, Movies, Broadway, and being one of the first online entertainment producers along with her compassionate, warm and deeply rooted Divine call to nurture, heal and empower others.